About Organization: The Advanced Centre for Treatment, Research and Education in Cancer (ACTREC) is the state-of-the-art R&D satellite of the Tata Memorial Centre (TMC), which also includes under its umbrella the Tata Memorial Hospital (TMH), the largest cancer hospital in Asia. 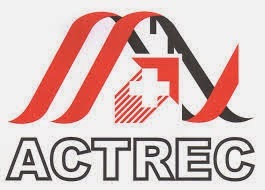 ACTREC has the mandate to function as a national centre for treatment, research and education in cancer. Qualification: BSc in any branch of life sciences with DMLT from a recognized institute and at least 2 years laboratory experience. Candidates with hands on experience in tissue culture and molecular biology will be preferred. How to Apply: Candidates fulfilling these requirements should pre register themselves by sending their application in the prescribed format with recent CV and contact details of 2 referees by e-mail to icgc@actrec.gov.in latest by 17:30 hrs on 9th May 2014.